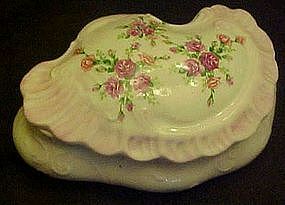 Pretty hand painted porcelain box just perfect for your bath or vanity. Fill this trinket box with pins, cotton balls, or whatever you fancy. Irregular shape with embossed scrolling in the mold, soft pink edge shading, and delicate pink sprays of roses on the top. Measures approx 3" tall with lid on, and is about 7" long. Perfect condition with no chips or cracks. No makers mark or sticker.